Courgette and Tomato Tian recipe | WTF Do I Eat Tonight? Courgettes and tomatoes are now in season and therefore cheap and this tian is a truly easy and delicious way to cook them both. 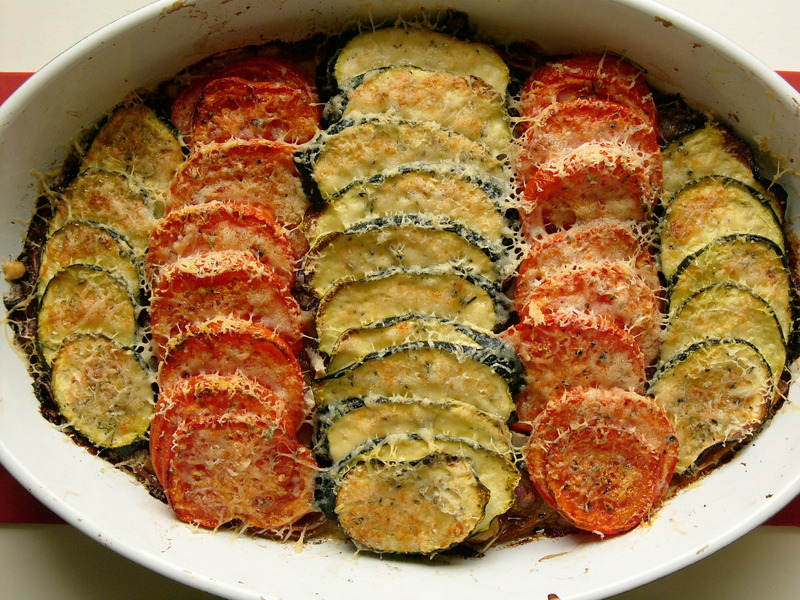 Tian, as I mentioned last week, is the Provençal word for an earthenware dish and, if you don’t have anything ovenproof and earthenware, just use any ovenproof dish in which you can layer slices of courgette and tomato. As long as it’s something big enough for the slices and relatively shallow, it will work. The original recipe used red peppers as well as onions but I never have any in the kitchen so I left them out. It makes a great, low-impact dinner served with some plain roasted chicken legs: shove the chicken in the preheated oven with some salt and pepper, prep the tian and then bake it for twenty-five minutes then add the cheese and bake for a final ten minutes. By the time the tian goes in, the chicken will have been roasting for a good ten minutes so they should happily be ready at about the same time. The tian is happy to be served warm or reheated too. 1. Preheat the oven to 190°C/170°C/gas 5. 2. Prep the ingredients: peel then chop/slice the onions and garlic. Slice the courgettes and tomatoes into thin discs, grate the cheese and take the leaves off the thyme sprigs. 3. Fry the onions and garlic in a pan with some olive oil over a gentle heat, until soft but not coloured. Then tip them into an ovenproof dish. 4. 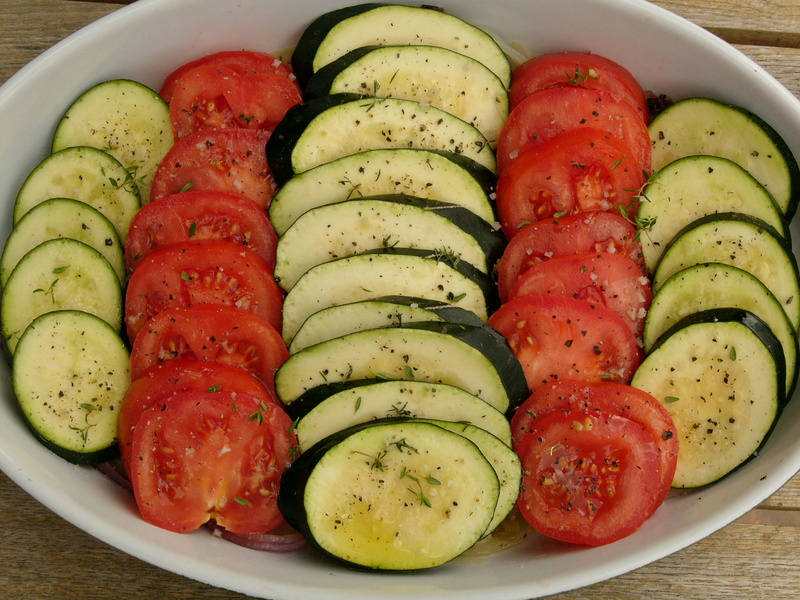 Place alternate rows of courgette and tomato slices on top of the onions, sprinkle with the thyme, a bit of salt and pepper and drizzle over a bit more olive oil. Bake for about 25 minutes. 5. After the first 25 minutes are up, check that the veg are soft (cook a little longer if not) then sprinkle the cheese over the surface and bake for another 5-10 minutes. This entry was posted in Cookery writers, Elisabeth Luard, Fast food fixes, Gluten-free, One pot, Recipes from magazines and newspapers, Spring vegetable recipes, Summer recipes, The Guardian, Vegetarian recipes, Wheat-free and tagged courgette recipes, Elizabeth Luard, the Guardian, tian recipes, vegetarian recipes. Bookmark the permalink.